Our days of roughing it in nature are long gone. We had many tent camping vacations when we were first married and when our kids were little. Setting up camp or breaking it down in the rain. Making a spit out of branches and cooking a rotisserie chicken over a campfire. Fighting off hoards of mosquitoes with smoke from damp logs. Trying to sleep on air mattresses that lost air during the night. 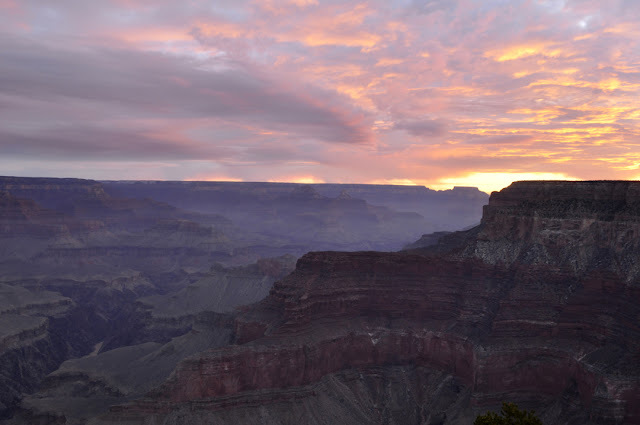 On the other hand, getting up at at the crack of dawn and waking my husband and two little boys to watch the golden sunrise at the rim of the Grand Canyon. Filled with amazement as the sun turned a simple maple tree into the burning bush with a double rainbow behind it. Nostalgic for the wonder that only spending time in glorious nature can provide, but wanting to do it in comfort, I found a company, Hammond Rentals, that would deliver a 30 foot RV to the state campground, set it up and have it in ready to move-in condition\ for us. We did have to bring everything we might need, from sheets, blankets, pillows to dishes, pots and pans, plates and tableware. This is where the "glamping" part comes in: we had a queen bedroom with a flat screen TV that swiveled from the living area to the bedroom, DVD player, microwave, stove, oven and even a shower. Michigan is a beautiful state, especially for waterfront vacations. It borders four great lakes and has over 60,000 inland lakes. We chose Ludington, on Lake Michigan for this trip, as much for the fantastic beach as for the Silver Lake Sand Dunes nearby. The entire western coast is dotted with little beach towns, each with their own unique lighthouse. The sunsets here, enhanced by a colorful cloud formations, are second to none. We felt like kids again as we took the Mac Woods dune ride, as the driver raced up and down the dunes, sliding sideways around curves in the sand. Another side trip was to Ember Elk Ranch in Silver Lake where we could feed the elk by hand and admired their stag, which had a 30 pt rack, totalling 600 inches, which will someday sell for $10,000. Elk shed and produce a new rack every year. Last year, in the same park I experienced the thrill of photographing my first American bald eagles. We spotted them in a tree and my patience was rewarded when they took flight twenty minutes later. Our friends brought their own RV and had the campsite next to us, so we had the best of both worlds: our privacy and great companionship. We'd never been to New Orleans and when The Little Mermaid tour, starring our friend Eric Kunze, made a stop there it was the perfect time to visit. The time of year wasn't ideal. It was very hot and humid. But our hotel, the W French Quarter, was set in a lively neighborhood surrounded by shops and homes with balconies overflowing with plants so we didn't have to walk far to enjoy the sights. For longer outings we often used Uber to get around. The sheer number of "must do" restaurants was overwhelming, one of the main reasons to visit this city. We feasted on crabcakes, gumbo and beignets until we couldn't eat anymore. Our final meal of the trip was one of the best dining experiences of our lives: Emeril's. We had no less than three waitstaff attending to our every need. Each course was impeccable: oysters, gumbo, pork chop and andouille crusted fish, ending with his famous banana cream pie. Despite his quirky TV persona, I developed a new respect for this chef. New Orleans is the place to overindulge in alcohol, encouraged by incredibly cheap drinks. Our hotel's restaurant offered 25 cent martinis ("limit of 3 per person, because 3 is enough"). The city has a dark side as well. Many travel guides will tell you to be careful where you walk at night and to stay on heavily populated streets. Tea rooms offering tarot card readings, voodoo and white-faced witches are common as well as scantily clad strippers outside of clubs. There has been much restoration since Hurricane Katrina 10 years ago, including the Sanger Theatre, which is where Eric was performing. 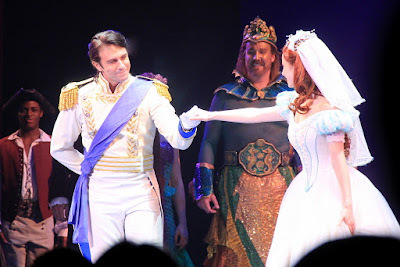 Every performance of The Little Mermaid played to capacity crowds, enthusiastic audiences which included many little girls eager to see their favorite Disney story. They lined up at the stage door afterward to see Ariel and Prince Eric in person. 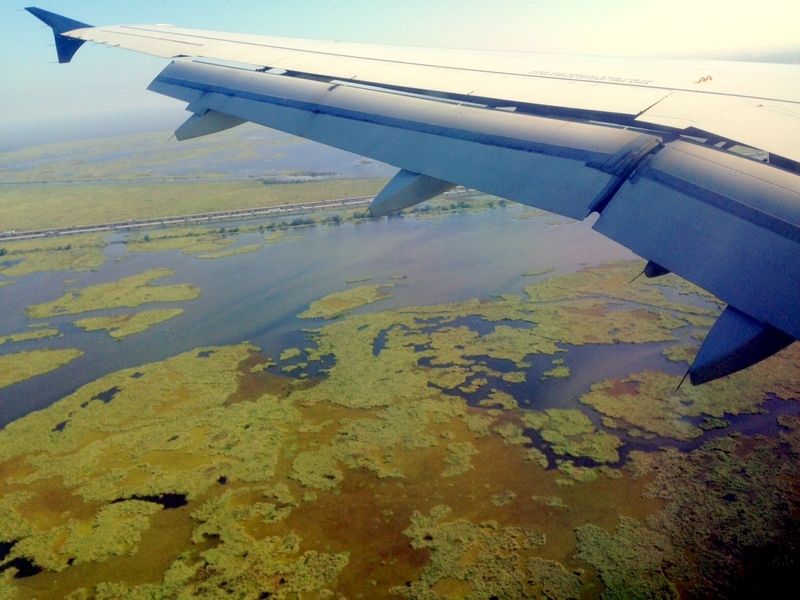 Only four nights in New Orleans was hardly enough to scratch the surface of what this city has to offer. We look forward to next time to explore all the places we didn't have time to see. 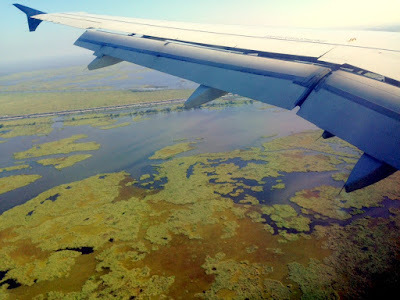 One place would be the bayou, which we only saw from the plane as we flew home.